Here we describe a method for preparation of both single read and paired end Illumina mRNA-Seq sequencing libraries for gene expression analysis based on T7 linear RNA amplification. This protocol requires only 10 nanograms of starting total RNA and generates highly consistent libraries representing whole transcripts. Sengupta, S., Bolin, J. M., Ruotti, V., Nguyen, B. K., Thomson, J. A., Elwell, A. L., Stewart, R. Single Read and Paired End mRNA-Seq Illumina Libraries from 10 Nanograms Total RNA. J. Vis. Exp. (56), e3340, doi:10.3791/3340 (2011). Whole transcriptome sequencing by mRNA-Seq is now used extensively to perform global gene expression, mutation, allele-specific expression and other genome-wide analyses. mRNA-Seq even opens the gate for gene expression analysis of non-sequenced genomes. mRNA-Seq offers high sensitivity, a large dynamic range and allows measurement of transcript copy numbers in a sample. Illumina’s genome analyzer performs sequencing of a large number (> 107) of relatively short sequence reads (< 150 bp).The "paired end" approach, wherein a single long read is sequenced at both its ends, allows for tracking alternate splice junctions, insertions and deletions, and is useful for de novo transcriptome assembly. One of the major challenges faced by researchers is a limited amount of starting material. For example, in experiments where cells are harvested by laser micro-dissection, available starting total RNA may measure in nanograms. Preparation of mRNA-Seq libraries from such samples have been described1, 2 but involves significant PCR amplification that may introduce bias. Other RNA-Seq library construction procedures with minimal PCR amplification have been published3, 4 but require microgram amounts of starting total RNA. Here we describe a protocol for the Illumina Genome Analyzer II platform for mRNA-Seq sequencing for library preparation that avoids significant PCR amplification and requires only 10 nanograms of total RNA. While this protocol has been described previously and validated for single-end sequencing5, where it was shown to produce directional libraries without introducing significant amplification bias, here we validate it further for use as a paired end protocol. We selectively amplify polyadenylated messenger RNAs from starting total RNA using the T7 based Eberwine linear amplification method, coined "T7LA" (T7 linear amplification). The amplified poly-A mRNAs are fragmented, reverse transcribed and adapter ligated to produce the final sequencing library. For both single read and paired end runs, sequences are mapped to the human transcriptome6 and normalized so that data from multiple runs can be compared. We report the gene expression measurement in units of transcripts per million (TPM), which is a superior measure to RPKM when comparing samples7. Add 1ml Trizol to cells/tissue, and homogenize with 18-22 gauze needle if necessary. Add 200 μl chloroform, and spin at 14,000 rpm for 30 minutes at 4 °C. Take out top aqueous layer, add 0.5 μl linear acrylamide, then add 500 μl isopropanol. Let sit at room temperature for 20 minutes. Spin at 14,000 rpm at 4 °C, wash pellet with 70% ethanol, and vacuum dry. Resuspend in 1 μl nuclease free water and transfer to 200 μl PCR tube. To the above 1 μl RNA add 1 μl of 100 μM oligo-dT-T7 reverse transcription primer (5'- GGCCAGTGAATTGTAATACGACTCACTATAGGGAGGCGGTTTTTTTTTTTTTTTTTTTTTTTT -3'), heat at 70 °C (heat block) for 5 min, and snap cool on ice. Add 1 μl 5x FS buffer, 0.5 μl DTT, 0.5 μl dNTP mix and 0.5 μl RnaseOUT (from SuperScript II kit). Heat to 42 °C in PCR machine for 1 minute, then add 0.5 μl Superscript II reverse transcriptase. Incubate for 1 hr at 42 °C. Heat at 70 °C for 10 minutes, cool to 4 °C. Incubate for 2 hr at 16 °C then add 1 μl T4 DNA Polymerase, and incubate for additional 10 minutes at 16 °C. Transfer to 1.5 ml eppendorf tube, and add 80 μl water. Add 0.5 μl of linear acrylamide. Add 72 μl 3 M NH4OAc and 480 μl of cold 100% ethanol. Precipitate for 1 hr at -20 °C. Spin at 14,000 rpm at 4 °C for 30 minutes, wash with 1 mL 70% ethanol, centrifuge at 14,000 rpm for 2 minutes, and vacuum dry for about 10 minutes. Resuspend above cDNA in 3.5 μl nuclease free water. To the above, add 1 μl each of the dNTPs (total 4 μl), 1 μl of 10X reaction buffer and 1 μl of T7 polymerase, and 0.5 μl of RnaseOUT from Megascript kit. Incubate at 37 °C in PCR machine overnight. Ready for next step. Can be stored at -80 °C. Add 26 μl of water to above reaction and 4 μl 10x fragmentation reagent. Heat in PCR machine at 70 °C for exactly 7 minutes. Add 5 μl of fragmentation stop buffer, put sample on ice. To the above reaction, add 60 μl water and 350 μl of buffer RLT from Rneasy MinElute kit, and mix by pipetting. Add 250 μl ethanol, mix by pipetting, and pipette into spin column. Spin at 8000 rcf for 20 seconds. Wash once with RPE, spin for 20 seconds, wash second time with 80% EtOH, spin for 2 minutes, and dry column with 5 minute spin. Elute RNA in 10 μl nuclease free water. Incubate at 70 °C for 5 minutes in thermocycler, and quick chill on ice. NotI Nonamer Primer (5'- TGAATTCGCGGCCGCTCAAGCAGAAGACGGCATACGAGCTCTTCCGATCT NNNNNNNNN -3'). The 5' proximal sequence is the NotI restriction site while the next sequence until the random region is the reverse complement of Illumina's adaptor B sequence from Chip-Seq kit. Put on thermocycler for 2 minutes at 42°C, add 1 μl of SuperScript III reverse transcriptase, and incubate at 42 °C for 1hr. *Instead of dCTP, 5-methyl dCTP was used in the dNTP mixture. Incubate at 65 °C for 5 minutes in thermocycler, and quick chill on ice. Put on thermocycler for 1 min at 45 °C, add 1 μl of SuperScript III reverse transcriptase, and incubate at 45 °C for 1 hour. Mix tube by inversion, give a short spin and incubate at 16 °C for 2 hr. Purify cDNA sample with Zymo columns, elute in 40 μl of water for single read and 30 μl of water for paired end library. Incubate in the thermal cycler for 30 minutes at 20 °C. Clean up cDNA using Zymo columns. Elute in 34 μl of EB for single read and 32 μl of EB for paired end library. Incubate for 30 minutes at 37 °C. Clean up cDNA using zymo columns. Elute in 10 μl of EB. Incubate for 15 minutes at room temperature. Adapters should be thawed on ice and diluted 1:20. Incubate for 15 minutes at 20 °C. Adapters should be thawed on ice and diluted 1:20. Clean up the ligation reaction using zymo columns. Elute in 44 μl of water for single read library and 6 μl of EB followed by another elution in 5 μl of EB for paired end library. Incubate for 2 hr to overnight at 37 °C, and purify reaction using zymo column. Elute with 6 μl of buffer EB followed by a second elution with 5 μl of EB. Perform the following using a 2% Sybr Safe E-Gel from Invitrogen. Run Program 0-PreRun 2 minutes. Load 1kb plus ladder from Invitrogen diluted 1:4, and load 10 μl. Load all of DNA sample, and fill empty lanes with 10 μl of water. Run Program 1-EGel 2% Run 28 minutes. Size select 200-300 bp gel slice with a fresh razor blade. Incubate at 50 °C for 10 minutes or until gel slice dissolves. Add 1 volume of ispropanol, and mix by inversion or pipetting. Add to column, spin for 1 minute at maximum speed, and discard flow-through. Add 500 μl of Buffer QG to column, spin for 1 minute at maximum speed, and discard flow through. Add 750 μl of Buffer PE to column, spin for 1 minute at maximum speed, and discard flow through. Centrifuge for 1 minute at maximum speed. Elute in 36 μl of EB for single read and 23 μl EB for paired end library. *The first time that the kit is used, dilute PCR primers 1:2 with EB buffer. Quantitate library using Qubit. It is ready for sequencing. Use sequencing primers from Illumina single read cluster generation kit V4 or higher for single read library and Illumina paired end cluster generation kit V4 or higher for paired end library. Bowtie6 was used to map reads to the RefSeq gene set (NCBI Build 36.1). The single end reads (30 nucleotides) and the pair end reads (42 nucleotides) were mapped allowing up to 10 matches to the gene set, and allowing up to two mismatches per read. Transcripts Per Million (TPM) values were obtained to measure gene expression using RSEM7 (RNA-Seq by Expectation-Maximization). 20. Representative Results: We made T7LA libraries for both single read and paired end runs from 1 μg, 100 μg, 10 μg, 1 μg and 100 pg starting total RNA (Figure 1). For evaluation of our protocol, we made single read and paired end libraries without T7 RNA amplification starting from 10 μg total RNA These control libraries, termed "MinAmp", have minimal amplification. The only amplification they undergo are the 10 cycles of PCR near the end of the protocol to ligate the Illumina sequencing adapters, a step common to all libraries. All RNA used were isolated from H14 human embryonic stem cells8. We first evaluated the number of genes identified by the various libraries (Table 1 and Supplementary Table 1). 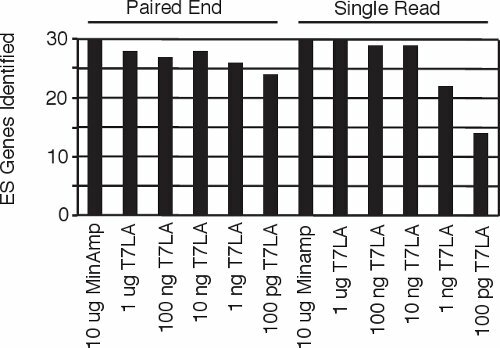 For both single read and paired end libraries, the 10 ng T7LA libraries identified almost the same number of genes as the 10 μg MinAmp libraries, with a TPM of 10 or more. In the case of the single read libraries, the 10 ng T7LA library identified 100% of the 8500 genes identified by the 10 μg unamplified library. For paired end libraries, the 10 ng T7LA library identified 86% of genes identified by the 10 μg unamplified library (7961 of 9267 genes). Libraries made from less than 10 ng were not able to identify as many genes. For example, in the single read protocol, the 1 ng library identified only ˜50% of the genes identified by the 10 μg MinAmp library, prompting us to limit the lowest amount of total RNA for use with the T7LA protocol to 10 ng. 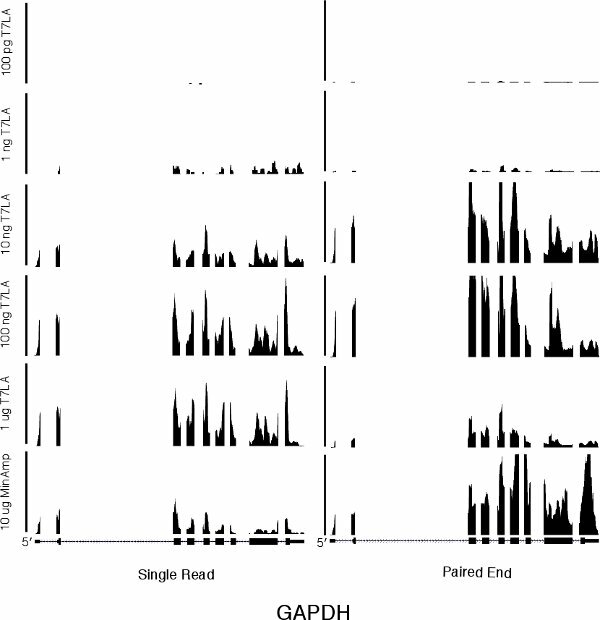 Moreover, mapping of a housekeeping gene, GAPDH (Figure 2) shows that all T7LA libraries made with at least 10ng of starting RNA identified all exons, including the extreme 5' exon. Comparison of the 10 ng T7LA single read and paired end libraries with the MinAmp libraries shows a high degree of similarity (Spearman correlation, R = 0.90 and 0.95 respectively, Figures 3a and b). We also compared the two single read and paired end libraries made from 10 ng total RNA and they had a very high correlation coefficient (R = 0.92), demonstrating that both types of libraries made using the T7LA protocol produce a very similar gene expression signature (Figure 3c.). Hence, the T7LA method is able to produce sequencing libraries that are as reliable and comprehensive as the MinAmp libraries, but from 1000-fold less starting material. Figure 1 Schema of paired end and single read library preparation protocol. Figure 2 A genome browser picture of a housekeeping gene, GAPDH, for all single read and paired end libraries. The scale bar on the left for the single read libraries indicates 350 total reads. The scale bar in the center for the paired end libraries indicates 5000 total reads. The horizontal axis represents the genome sequence of GAPDH. Figure 3 Correlation of gene expressions between the various libraries (Spearman's): A. Between single read 10 ng T7LA and 10 μg MinAmp library shows that both these libraries have a very similar gene expression pattern (R = 0.90). B. Between paired end 10 ng T7LA and 10 μg MinAmp library demonstrates their similarity of gene expression profiles (R = 0.95). C. Correlation of gene expressions between 10 ng paired end and 10 ng single read libraries show a high degree of similarity between these libraries prepared by the T7LA method (R = 0.92). 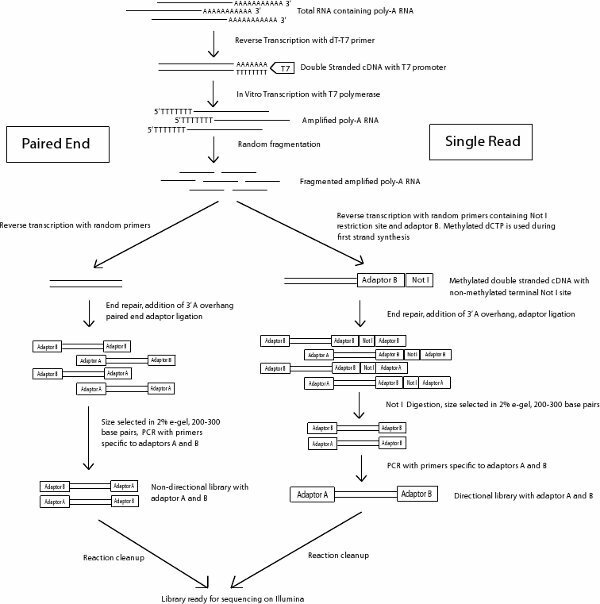 Figure 4 Identification of human embryonic stem cell specific genes5 from all the single read and paired end libraries. Table 1. Information on cluster numbers, genes identified, error rate, percent alignment of the single read and paired end libraries. Supplementary Table 1. List of all genes and their TPM values for all samples, single read and paired end. Current protocols for making paired end libraries require between 1 μg9 to 2.5 μg10 starting amount of total RNA. Here we present our linear T7 amplification based (T7LA) method to prepare both single read and paired end Illumina sequencing libraries and show that this method allows generation of libraries from as low as 10 ng of total RNA, producing data that is comparable to that of minimally amplified (MinAmp) libraries made from 1000 fold more starting material (10 μg total RNA). The 10 ng libraries not only identify similar total numbers of genes, but also produce gene expression signatures that are similar (Figures 3a and b). Moreover, both the single read and paired end libraries produced by the T7LA method are very similar to each other (Figure 3c), which allows researchers to compare data generated by libraries made from either protocol. Since these libraries were prepared from human embryonic stem cell RNA, we searched for 30 stem cell specific genes among the libraries and find that almost all of these genes (93-100%) are identified by the libraries made from at least 10 ng of starting total RNA (Figure 4), thus validating our protocol. We believe our protocol would be very useful for researchers, especially in circumstances such as flow sorted cells or laser-micro-dissected tissue where starting material is limiting. In such circumstances, our protocol would allow generation of gene expression data comparable to libraries made from much larger starting quantities since our protocol produces expression profiles comparable across at least 3 orders of magnitude of starting RNA. The authors disclose that J.A.T. is a founder, stockowner, consultant and board member of Cellular Dynamics International (CDI). He also serves as scientific advisor to and has financial interests in Tactics II Stem Cell Ventures. This work was supported by funding from the Morgridge Institute for Research and the University of Wisconsin Foundation. We thank Krista Eastman for editorial assistance. Tang, F., Barbacioru, C., Wang, Y., Nordman, E., Lee, C., Xu, N., Wang, X., Bodeau, J., Tuch, B. B., Siddiqui, A., Lao, K., Surani, M. A. mRNA-Seq whole-transcriptome analysis of a single cell. Nature Methods. 6, 377-382 (2009). Armour, C. D., Castle, J. C., Chen, R., Babak, T., Loerch, P., Jackson, S., Shah, J. K., Dey, J., Rohl, C. A., Johnson, J. M., Raymond, C. K. Digital transcriptome profiling using selective hexamer priming for cDNA synthesis. Nature Methods. 6, 647-649 (2009). Mortazavi, A., Williams, B. A., McCue, K., Schaeffer, L., Wold, B. Mapping and quantifying mammalian transcriptomes by RNA-Seq. Nature Methods. 5, 621-628 (2008). Mamanova, L., Andrews, R. M., James, K. D., Sheridan, E. M., Ellis, P. D., Langford, C. F., Ost, T. W., Collins, J. E., Turner, D. J. FRT-seq amplification-free, strand-specific transcriptome sequencing. Nature Methods. 5, 130-132 (2010). Sengupta, S., Ruotti, V., Bolin, J., Elwell, A., Hernandez, A., Thomson, J., Stewart, R. Highly consistent, fully representative mRNA-Seq libraries from ten nanograms of total RNA. Biotechniques. 49, 898-904 (2010). Langmead, B., Trapnell, C., Pop, M., Salzberg, S. L. Ultrafast and memory-efficient alignment of short DNA sequences to the human genome. Genome. Biology. 10, R25-R25 (2009). Li, B., Ruotti, V., Stewart, R. M., Thomson, J. A., Dewey, C. N. RNA-Seq gene expression estimation with read mapping uncertainty. Biotechniques. 26, 493-500 (2010). Thomson, J. A., Itskovitz-Eldor, J., Shapiro, S. S., Waknitz, M. A., Swiergiel, J. J., Marshall, V. S., Jones, J. M. Embryonic stem cell lines derived from human blastocysts. Science. 282, 1145-1147 (1998). mRNA-Seq-8 Sample Prep Kit [Internet]. Illumina. Available from: http://www.illumina.com/products/mrna_seq_8_sample_prep_kit.ilmn Forthcoming. ScriptSeq mRNA-Seq Library Preparation Kit (Illumina -compatible) Epicentre [Internet]. Epicenter. Available from: http://www.epibio.com/item.asp?id=578 Forthcoming.